For Jeremy Benson, science is more than a career path or set of facts. It’s a way of understanding and interacting with the world that’s available to everyone, not just a rarified few. “My biggest motivator is to do whatever I can to help dispel the myth that only certain people can understand science,” says Benson, a STEM educator in the NIU Center for P-20 Engagement. As part of the STEM Outreach team, Benson introduces students from elementary through high school to the joys of science through interactive, hands-on camps, classes and activities that build on their interests. 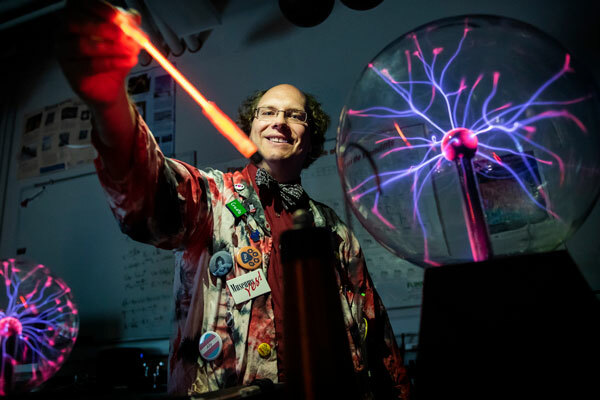 “Jeremy has been instrumental in the creative expansion of our STEM camp choices, adding sessions based on exploring STEM through following the interests of kids and teens: science fiction, electricity and magnetism, magic and robotics. He’s created many of our hands-on displays and developed unique projects for our campers, such as a light sword and a motion reactive light-up ‘magic’ wand,” says STEM Outreach director Pati Sievert. Among his colleagues, Benson is known for his work ethic and mentorship. Jasmine Carey, who earned her bachelor’s degree in industrial management and technology from NIU in 2017 and is currently pursuing her master’s degree in instructional technology, has worked with Benson as a STEM camp counselor and instructor. “Working with Jeremy has been great,” Carey says. “He’s a fountain of knowledge, and he’s always willing to help. Through his trust and leadership, Jeremy has taught me to be more confident in my abilities.” Because of her work with STEM Outreach, Carey has decided to pursue a career as a STEM educator, continuing Benson’s mission to build enthusiasm and knowledge of science, technology, engineering and math fields among all young people. Benson explains that his greatest reward is the joy of watching students learn.